Yesterday I posted some thoughts on Alexandra Pope’s book „The Wild Genie“. I did it in German, because, unfortunately, it’s not available in that language, and I really wanted to share at least part of its message with the German-speaking audience as well. 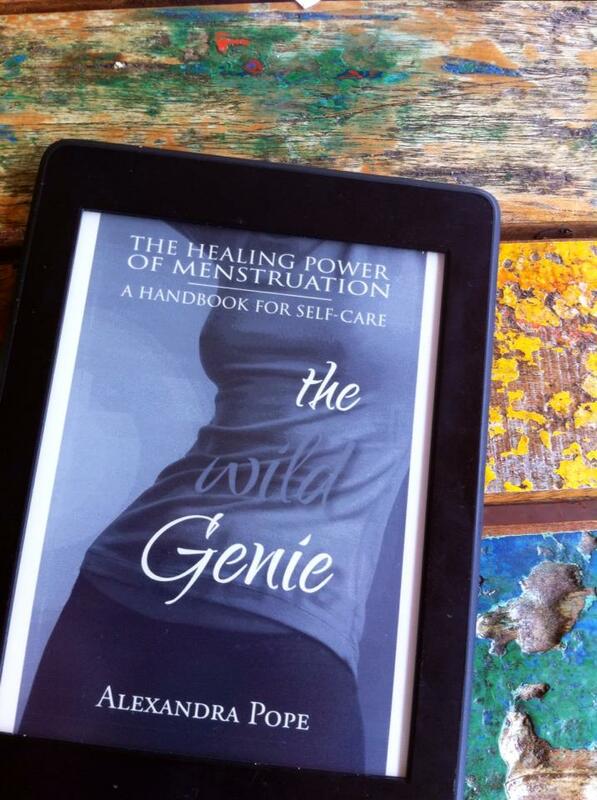 The book was recommended to me in one of Tina Nance’s workshops on the female hormone cycle. As already mentioned in my post on Ubud/Bali (https://angryprincessblue.com/2015/08/03/six-months-in-ubudbali-recommendations-for-yoga-meditation-vegan-food/), I love Tina and what she does. And I can really recommend you to listen to this interview with her to get an idea of what she shares: https://www.youtube.com/watch?v=mYjbXKxeGBo&feature=youtu.be. I also found this interview with Alexandra Pope that might give you an overview on her stance on menstruation and the female cycle: http://www.pukkaherbs.com/…/wellb…/alexandra-pope-interview/. Our collecitve discomfort around menstrual blood has its source partly in the excellent tutoring we’ve received in devaluing all that is female. But our loathing of the blood also speaks volumes about the fear of entering the deep world of female knowledge that lies in the experiences of the female body. If we are to restore the power of the feminine we must also reclaim the language associated with it. Words and phrases like „being with“, „letting go“, „not doing“, „yielding“, „being moved by“, „surrendering“, „being guided by“, „non-linear“, „allowing“, „being receptive“. The problem is not that menstruation exposes us to deeper feeling, but rather a culture that doesn’t know how to live with this complexity. Each month as the premenstruum comes around, you’ll be reminded of what you didn’t attend to or what wishes to be known in you. If you consistently hold back some frustration, you’ll find yourself angry. If you gave too much to others and didn’t attend to your own creative endeavours you may feel empty and irritated. It’s better to find someone to help you learn how to go with your depth of feeling, than it is to medicate it. We have a natural ability to regenerate after such experiences and useful though medication can feel in the moment, it may be depriving you of that renewal and a life greatly enriched from the experience. Pope also offers many insights on diet and so many other things that might harm or help us to live in alignment with our menstrual cycle and ourselves. So if you ever get the chance to look into this book, go for it.